Produktinformationen "Deluxe Box - Arkham Horror Card Game - versandkostenfrei"
Die Karten passen mit Sleeves in die Box. Includes 4 engraved wooden player boards, to keep optimal overview. Holds up to 2 base games + 16 big and small expansions! Organized in thematic trays. Perfectly displayed components. 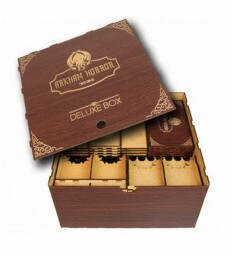 Improve your gaming experience with this Deluxe Box storage solution! Weiterführende Links zu "Deluxe Box - Arkham Horror Card Game - versandkostenfrei"
Kundenbewertungen für "Deluxe Box - Arkham Horror Card Game - versandkostenfrei"